Salisbury cushions are a thick rectangular cushion which can be used to make a Salisbury style bench more comfortable, or provide a splash of elegant style and colour to the garden, coming in Forest Green, Navy Blue and Ecru. Salisbury cushions have double edge piping and a subtle zip which doesn’t ruin the line of the cushion, but makes the cover easy to remove and clean. 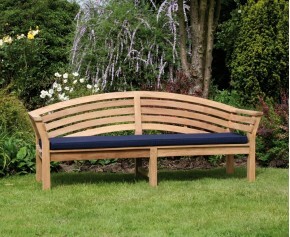 Brighten up your outdoor furniture and sit in the ultimate comfort, with this garden 4 seater bench cushion. Expertly woven in polyester for long life and aesthetic appeal, this great value Salisbury garden 4 seater bench cushion will be the envy of all your friends.